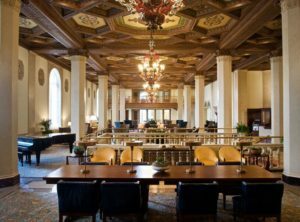 The new Marriott Syracuse Downtown combines traditional grandeur with a very modern sense of style and convenience. Located in a magnificently restored historic building dating from 1924, our hotel provides an ideal destination for business trips and romantic getaways. All of our spacious, gorgeously appointed rooms and suites feature the finest quality Stickley furniture, as well as marble bathrooms and pillowtop bedding. Stop by Eleven Waters, our hotel restaurant, for fresh American cuisine in a casual bistro ambiance. We also offer a lively Irish pub, a deli and a coffee house. If you’re organizing an event here in Syracuse, you’ll be thrilled with our expansive, state-of-the-art meeting venues and facilities, as well as our status as the official hotel of the OnCenter Convention Center. And if you’re in the mood to explore, we’re just minutes from downtown attractions including Armory Square and State University of New York (SUNY). Make plans to experience the stunning new Marriott Syracuse Downtown! Please make your reservations by August 27, 2019 to ensure availability and rate. Don’t forget to mention that you are part of the Central New York Dental Conference. Rates available for 9/12/19 and 9/13/19 only. Syracuse Hancock International Airport is located north of the City of Syracuse with direct access from Interstate 81(N-S), which connects to Interstate 90, the NYS Thruway (E-W). For general information call (315) 454-4330. You may also visit their website at Syracuse Airport. 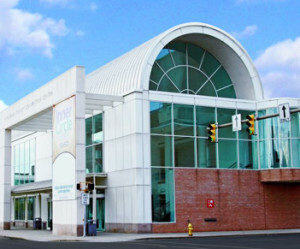 Marriott Syracuse Downtown offers a complimentary shuttle service to and from Syracuse Hancock International Airport. Please call 315-474-2424 for pickup upon arrival at the airport. Drop off service can be arranged at the hotel. Space is based on availability. You may also visit their website at Marriott Syracuse Downtown. Syracuse Regional Airport Taxi provides taxi and van service on an exclusive basis at Syracuse Hancock International Airport. Passengers requiring ground transportation service can register with Syracuse Regional Airport Taxi at one of the dispatch areas located near each baggage claim location. These areas are staffed between the hours of 5:00 a.m. and 2:00 a.m. Syracuse Regional Airport Taxi also offers a shuttle van service, which is an economical alternative for individuals traveling to the same location. If you have any questions regarding ground transportation provided by Syracuse Regional Airport Taxi please contact their office at (315) 437-5555. You may also visit their website at Syracuse Taxi. UBER is now providing service to and from the Syracuse Hancock International Airport. Amtrak Station in Syracuse, NY (SYR) is located at 1 Walsh Circle, Regional Transportation Center. It has an enclosed waiting room and handicapped accessibility. No wifi is available. Routes: Lake Shore Limited, Empire Service and Maple Leaf. You may also visit their website Amtrak Syracuse. Exit 36, Rt. 81 South to Syracuse. Harrison Street Exit 18, right on Harrison, two blocks, left on State Street, left into The Oncenter parking garage. Rt. 81 South to Harrison Street Exit 18, right on Harrison, two blocks, left on State Street, left into The Oncenter parking garage. Rt. 81 North to Adams/Harrison Street Exit 18. Straight one block, left on Harrison, two blocks, left on State Street, left into The Oncenter parking garage. 690 East or West, West Street Exit, follow West Street, 5th light left on Shonnard Street which turns into East Adams. Follow East Adams, 7th light turn left onto South State Street, right into The Oncenter parking garage.